By Craig CalcaterraI saw these guys on last night’s broadcast. Hat tip to Ted Berg of USA Today for getting the screen cap: We wouldn’t accept it if these guys showed up at a party in blackface. We wouldn’t cite “tradition” or “enthusiasm” and act as if it wasn’t racist for them to do so. If they wore blackface at a ballpark I am pretty confident that security would have them removed, for their safety among other reasons. But of course it is offensive. And disgraceful. And as long as the Cleveland Indians continue to use Chief Wahoo as their mascot and primary logo, idiots like these three will believe that it is socially acceptable to do with Indians that which we would never tolerate if it was done with other races. 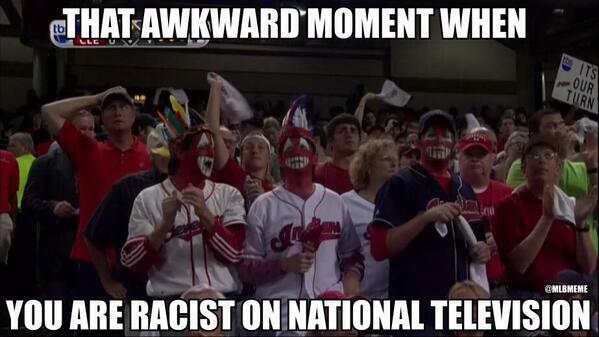 They will be given the official cover to make specious arguments excusing their racist acts.Why Did TBS Show Cleveland Fans Dressed Up In Redface? By Travis WaldronFans obviously don’t see much of a problem with this sort of dress-up, because they do it at Indians games and Washington Redskins games and at other sporting events featuring Native Americans. They Tomahawk Chop and depict Native Americans getting slaughtered and all sorts of other ignorant things because they are fans and because the appropriation of Native American imagery and culture in sports, not to mention in the rest of society, has desensitized them to the fact that Native Americans deserve respect. We’d never be OK with this if it was another racial minority being depicted, if fans showed up to games wearing blackface. Comment: This should be the next target of the activists targeting the Washington Redskins. Heck, they should target both offenses simultaneously to take advantage of the growing concern about mascots. For more on Chief Wahoo, see Make Indians' Owner into Mascot and Semipro Team Uses Chief Wahoo.